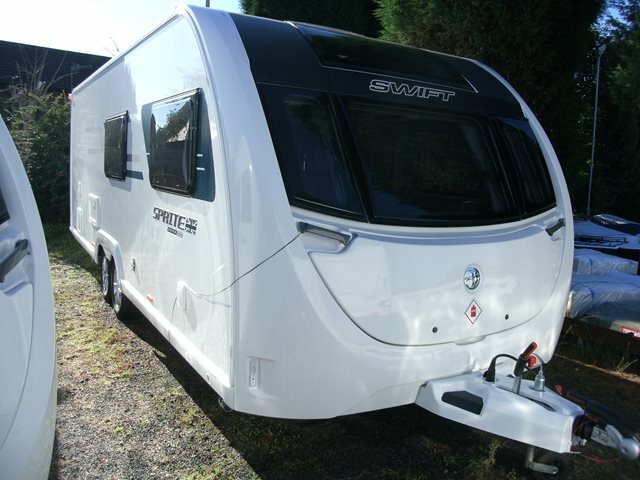 Our new Swift Sprite Super Quattro DB SR is shown below, for more information please contact us. This six berth, 8 foot wide Super Quattro DB features parallel bench seats to the front, central kitchen, large side dinette, nearside fixed bunk beds and an offside corner wash room. Our Quattro also includes the optional panoramic front sun roof and Diamond Pack (AL-KO AKS 3004 stabiliser, microwave, alloy wheels, door flyscreen, AL-KO Secure wheel lock receiver, two scatter cushions and NEW for 2019 integrated DAB & FM radio). For any further information please contact us on 01384 413336 and ask for a member of the sales team.